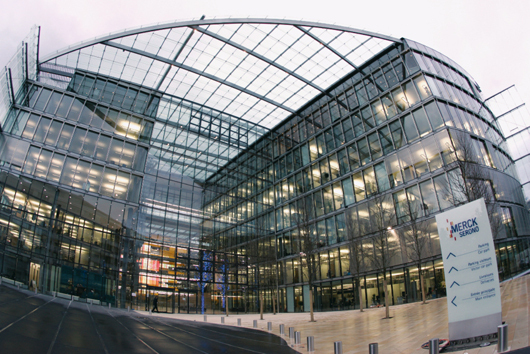 Merck KGaA is to close the Geneva headquarters of its biotech unit Merck Serono as part of a cost saving plan that will see workforce reductions across all its Swiss-based global operations. Around 500 jobs will be lost from the existing workforce of 1,250 at the site (pictured above), with the company looking to relocate the remaining 750 people, some of which it wants to move to its other European headquarters in Germany's Darmstadt. The company also plans to transfer key research and development positions from Geneva to Darmstadt, Boston and Beijing, “to ensure state-of-the-art clinical development in all key growth markets”. Merck's Swiss manufacturing facilities will also be hit by the move. Biotech production will continue at its Aubonne and Corsier-sur-Vevey sites, but 80 jobs will be cut across those two sites and a third at Coinsins. Manufacturing operations at the Coinsins site will mainly be relocated to Aubonne, as will more 130 technical manufacturing positions from Geneva. “The planned measures for Merck Serono's operations in Switzerland are needed to ensure our global competitive position in a rapidly changing market and to secure the long-term future of the company,” said Stefan Oschmann, Merck executive board member with responsibility for its Merck Serono division. The move is likely just the first stage in the pharma company's efficiency drive, which Merck said in February could hit "all businesses and regions" and is aimed at “addressing unprecedented market shifts, increasing competition in key product areas and existing inefficiencies”. Merck was able to offer a degree of reassurance to some of its Swiss employees, and said that Swiss market operations in Zug would continue, but the closure of the Geneva site, home to 7 per cent of Merck Serono's 17,000 workforce, will be a major blow to employees. The company said it will work closely with those affected to find 'socially responsible solutions', beginning tomorrow (April 25) with an employee consultation process. This will see Merck “gather and evaluate” alternative suggestions from its employees and the company said it will work with them to identify re-deployment opportunities. This end Merck has earmarked up to €30m for seed funding for possible spin-off and start-up opportunities, as long as they have long term potential and focus on activities and compounds that are not core to Merck Serono's current and future business objectives. Merck said relocations and workforce reductions will begin in the second half of 2012 and the process should be completed in the first half of 2013. The pharma company's decision to cut staff numbers and sharpen its focus on key markets echoes action taken by many in the sector. In February AstraZeneca said it would shed around 7,300 jobs as part of a major restructuring of its business and SkyePharma announced plans in January to specifically cut back its investment in Switzerland, with a 20 per cent reduction in its operations in the country, which are primarily based in Muttenz. However, fears Novartis would close its Swiss chemicals site in Basel, which would have affected 760 jobs in the city, have not been realised after the pharma company changed its mind, subsequently deciding to increase its manufacturing presence in Stein, Switzerland.